A massage is always a pleasant experience, but rather than booking a solo massage, spread the joy with a couples massage. Married couples, people who are dating, and even groups of friends are welcome to book couples massages. These packages offer savings over single massages, and you get even more value when you book an extended session. View our pricing. A Swedish massage is the traditional massage that most people think of when they hear the word massage. These couples massages let you and your partner enjoy the classic benefits of spending time on the massage table. As our massage therapists rub your muscles, it stimulates your circulation and improves your cell metabolism. The massage session also reduces stress hormones, while boosting your supply of serotonin and other happiness hormones. Consider upgrading to the Oligomer massage for couples. This massage features the classic Swedish massage explained above, but it also integrates Oligomer oils. These products replenish the vital elements, vitamins, and minerals that your skin loses over time, and as these elements are restored, you get an energy boost. If you enjoy being on the same level as your friend or partner, this couples massage helps to make that possible. Rather than you receiving a nourishing experience on your own, you both get a boost at the same time. That’s ideal for safeguarding your synergy. Marked by the firm use of pressure that gets deep into your tissues, a deep tissue couples massage is the ideal way to melt away stress and release tension. Whether you get a deep tissue massage on your own or with someone else, these massages loosen knots and relax bands of rigid tissue. Knots and rigid tissue can disrupt circulation, limit motion, and lead to inflammation. That all increases your pain levels, making it harder to do routine tasks and potentially even hurting your mood. A deep tissue massage gets at the heart of these issues so that you and your partner feel better in both body and mind. Note that a deep tissue massage isn’t just Swedish massage with harder strokes. Rather, it uses specific techniques to produce quality results. During a hot stone couples massage, our massage therapists use hot stones as an extension of their bodies. They place smooth flat volcanic rocks on your body, and this aids with relaxation. The stones may be placed on your spine, arms, legs, hands, feet, and toes, and if you and your partner are comfortable, the massage therapist may have you roll over so that they can place hot stones on your stomach, chest, and even your face. Then, they use the long circular motions associated with Swedish massage to complete the process. 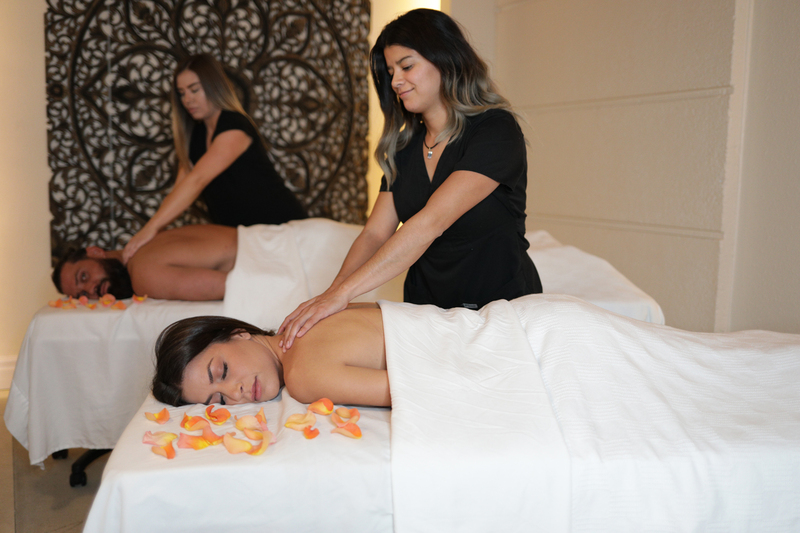 This can involve vibrations, tapping, and kneading, all designed to make you and your partner feel as renewed as possible when you leave our spa. At a Touch of Las Vegas Spa, we offer anti-aging facials for all skin types, but these treatments are particularly ideal for mature skin. Whether you’re on vacation or just need a break from your busy Vegas life, this pampering treatment is just the thing — it’s a veritable fountain of youth for the skin. Many of our clients say they feel younger instantly. To make an appointment for an anti-aging facial on its own or paired with any of our other delightful spa services, contact us today.